Recognized as a great choice for young readers only months after its first publication. the statewide "readers' choice awards" for children's books. The annual Kentucky Bluegrass Awards (KBA) were established in 1982 to encourage Kentucky students in grades K - 12 to read quality children's literature. It encourages student reading and subsequent critical thinking and is actively supported by public and private schools as well as libraries throughout the state. Initially, only one Bluegrass Award was presented each year. But, over time, separate categories were created for books aimed at different age groups. The four current categories include kindergarden through second grade, grades three through five, grades six through eight, and high school. Any new or recently published book can be suggested as a nominee by any adult Kentucky resident - teacher, librarian, parent, or ordinary reader. Then, each spring, the KBA selection committee of teachers and librarians screens and narrows these suggestions down to a master list of official nominations for the coming academic year. 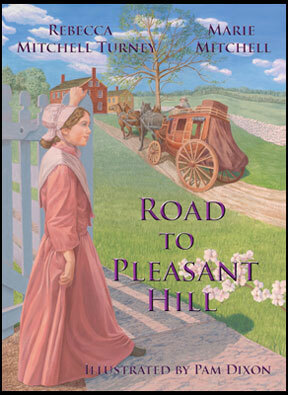 Ten books, including Road to Pleasant Hill, have been selected for the KBA Grades 3-5 Master List for the 2010-11 academic year. Road is the only one of the ten entirely written and published in Kentucky by Kentucky authors and a Kentucky publisher. Although one other nominee was written by a Kentuckian, it was published out of state. "Simply having our book suggested as a nominee was flattering," said co-author Marie Mitchell. "To actually have it chosen as a finalist and placed on the Master List is absolutely wonderful. It's a real honor." Her sister, co-author Rebecca Mitchell Turney, echoed this sentiment. "This is a dream come true," she said. "We wrote our book to present Kentucky girls with strong role models and interesting stories. Now, as a Bluegrass Award nominee, our book is being publicly recommended for third through fifth grade readers by teachers and librarians all across the state." When schools open in the fall, Kentucky students in grades K-12 will begin reading and voting for their favorites among the KBA nominees. Balloting will continue until next spring when the KBA selection committee will tally the votes, announce the winners, and issue a Master List of new nominees for the following year. According to the KBA Web site, the process of selecting the winners is meant to involve the entire Commonwealth. Kentucky students in grades K-12 read and rate the books that Kentucky adults nominate, and a wide range of schools, libraries, bookstores, community groups and even individuals promote and support the program to get interesting new books into the hands of as many Kentucky children as possible.